With a very pleasing weight and feel, The Derwent Precision cuts a very sleek and ergonomically designed figure, whilst giving artists the versatility they require. To get the feel of my new acquisition, I took some scrap paper and just scribbled and doodled for a while. Upon application I found the leads to be nice and strong, taking a fair amount of pressure and punishment. They also delivered a nice even application; some brands I have used in the past contain ‘hard’ particles that scratch the paper surface. 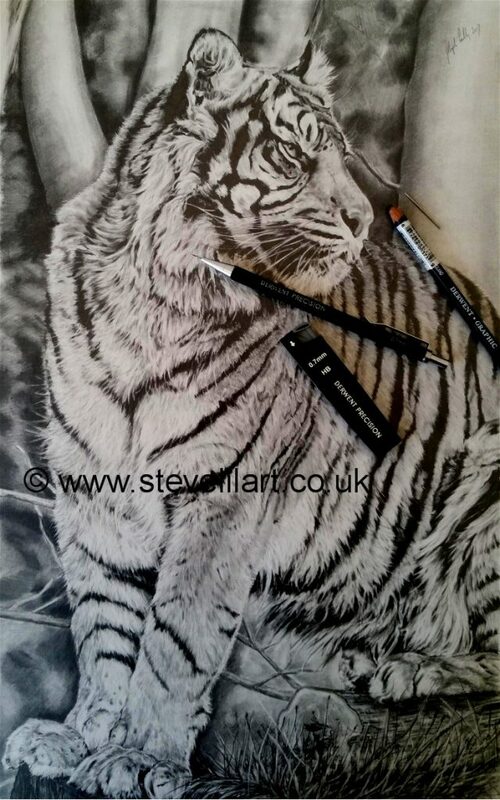 I was now ready to hit a ‘live’ project, and had just the test: a large A2 study of a tiger. My reference was a series of photos taken at Dudley Zoo of Joao, a young Sumatran Tiger. Joao is part of a major international conservation project to protect this critically endangered species (there are now fewer than 400 of these magnificent beasts left in the wild). As I usually work with a 0.5mm lead I was a little apprehensive having to use a slightly thicker lead. I need not have worried as it handled beautifully and was easy to sharpen to the finest of points for even more detail where required. The under drawing was mapped out lightly with the Precision HB. I then hatched in the darker facial features and stripes with the Precision and a 2B lead. At this point I could see that the composition and tonal balance was going to work so I went in all guns blazing with a Derwent Graphic 9B working on both the animal and background simultaneously. I overlaid the hatched stripes with 9B Graphic Pencil leaving ‘tatty edges from the previous layer showing through. I then used a medium blending stump to merge the two layers together. Happy with progress I now focused on the detail. As always, I started in the top left corner and worked down the paper to stop smudging where possible. I lightly pencilled in the whiskers and pure white hairs and then ran a needle along these lines creating an indent in the paper. 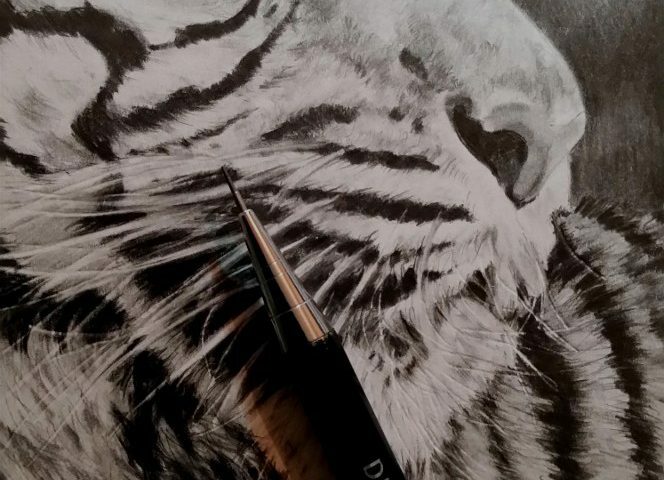 As subsequent layers of pencil were laid down, the indents and whiskers came to life. It was then just the laborious task of building up the layers of fur: alternating between 2B/HB in the Derwent Graphic range , a blending stump, needle and various erasers. To finish the effect I added fine hair with the 0.5mm Derwent Precision. The Precision was a joy to work with! 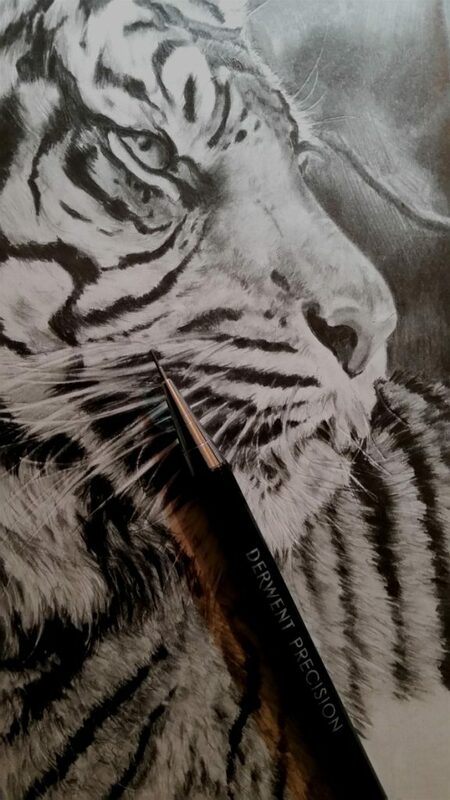 Beautiful drawing, I’ll definitely consider the derwent precision. Cheers Maria, I highly recommend the precision it was a joy to work with.